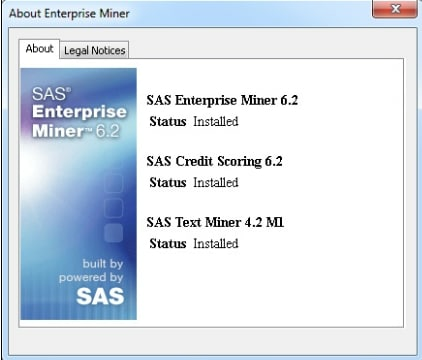 In December 2009, SAS Text Miner 4.2 was released. When you apply the third maintenance release for SAS 9.2, SAS automatically updates any existing SAS Text Miner installation to the 4.2 release. For more information, see About the Deployment Summary. For more information about this release, see “What's New in SAS Text Miner 4.2” at http://support.sas.com/documentation/onlinedoc/txtminer. Use the following table to determine what (if any) post-configuration steps you need to complete. To determine the product release number for SAS Text Miner, see the deployment registry report that you generated before you applied the third maintenance release. For more information, see Determining the Product Release Numbers for Products at Your Site. You are upgrading to SAS Enterprise Miner 6.2, and you are currently running SAS Text Miner at your site. When you upgrade to SAS Enterprise Miner 6.2, the first maintenance release for SAS Text Miner 4.2 is automatically applied. For more information, see SAS Text Miner 4.2_M1. In addition, if you have not applied the third maintenance release for SAS 9.2, these updates are also applied when you upgrade to SAS Enterprise Miner 6.2. To upgrade to SAS Enterprise Miner 6.2, see SAS Enterprise Miner 6.2. After you have completed the upgrade process, you need to reconfigure SAS Text Miner. For more information, see How to Reconfigure SAS Text Miner. You are applying the third maintenance release for SAS 9.2, and the product release number for SAS Text Miner is 4.1. When you apply the third maintenance release for SAS 9.2, SAS Text Miner 4.2 is installed. If you were previously running SAS Text Miner 4.1, then you must manually complete the post-configuration steps for SAS Text Miner. For more information, see How to Reconfigure SAS Text Miner. SAS Enterprise Miner is automatically configured when you apply the third maintenance release, so no manual configuration steps are required for SAS Enterprise Miner. You are applying the third maintenance release for SAS 9.2, and the product release number for SAS Text Miner is 4.2. 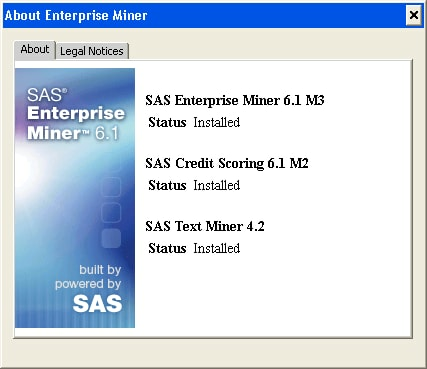 A product release number of 4.2 indicates that you upgraded to SAS Text Miner 4.2, which was released in December 2009. During that update, if you reconfigured on the SAS Analytics Platform Server and on any client machines, then you do not need to complete any post-configuration steps to reconfigure SAS Text Miner after installing the third maintenance release for SAS 9.2. SAS Enterprise Miner is automatically configured when you apply the third maintenance release, so no manual configuration steps are required for SAS Enterprise Miner. However, if you did not reconfigure your client machines when you upgraded to SAS Text Miner 4.2, then SAS Text Miner Java Client is listed under “Products to Install” in the Deployment Summary. In this case, you must reconfigure SAS Text Miner and SAS Enterprise Miner. For more information, see How to Reconfigure SAS Text Miner. You have applied the third maintenance release for SAS 9.2, and you have upgraded to SAS Enterprise Miner 6.2 and the first maintenance release for SAS Text Miner 4.2. No post-configuration steps are required for SAS Enterprise Miner 6.2 and SAS Text Miner 4.2. However, post-configuration steps could be required for the products that you are updating. Review the “Product-Specific Details and Post-Configuration Requirements” chapter in Parts 3 and 4. Start the SAS Deployment Wizard from the highest-level directory in your SAS Software Depot. Note: In a multi-tier deployment, SAS Text Miner needs to be reconfigured on the server where the SAS Analytics Platform is installed and on any client machines. In the Select SAS Software Order step, select the SAS Software Order for your deployment, and then click Next. Verify that the directory for SAS Home (also called the SAS installation directory) is the directory that you selected in your initial deployment. In the Select Deployment Type step, select Configure SAS software, and then click Next. 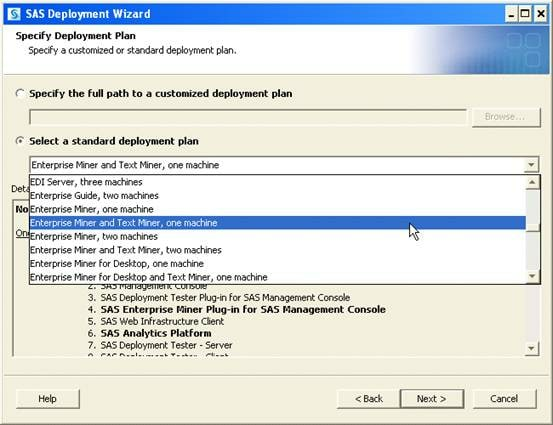 In the Specify Deployment Plan step, select the plan that was used for the original configuration of SAS Text Miner, and then click Next. In the Select Machine to Configure step, select a machine from your deployment plan. If you selected Enterprise Miner and Text Miner, two machines as your deployment plan, then in the Select Configuration Prompting Level step specify when to display the configuration dialog boxes. The recommended prompting level is Typical. Note: If you did not accept the default repository name of Foundation in your original deployment, then select Custom so you are prompted for the repository name during the reconfiguration process. In the Specify Configuration Information step, select your existing configuration directory, and then click Next. When you are prompted to confirm your selection, click Yes. In the Select Products to Configure step, select SAS Enterprise Miner Client Configuration and SAS Text Miner Java Client. Click Next. Note: If you are using a Web application server at your site, then you must stop the managed servers and reconfigure the Web application server as well. It is important to reconfigure your Web application server in the same manner that it was configured initially. If you manually configured the Web application server when you deployed SAS 9.2, then reconfigure it manually. 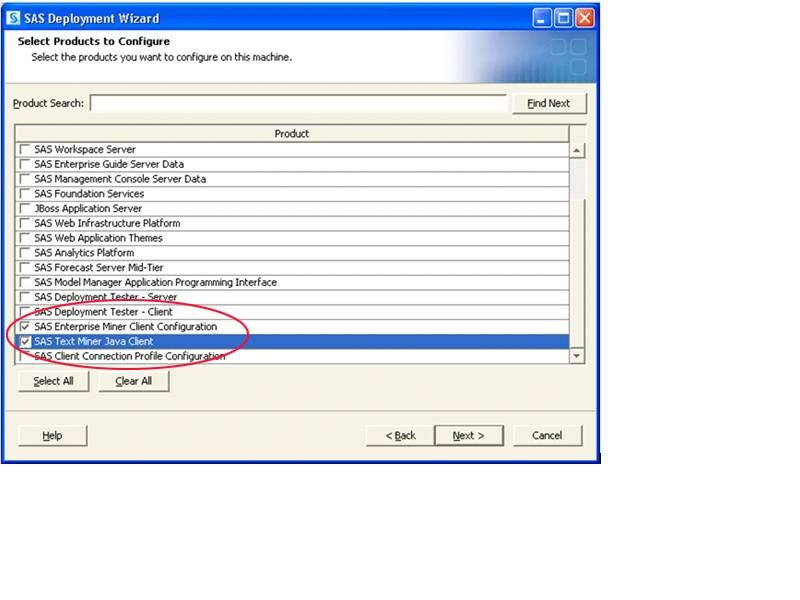 If the SAS Deployment Wizard automatically configured your Web application server, then choose the automation configuration option. Enter the appropriate values for the remaining steps in the SAS Deployment Wizard. In the Deployment Summary step, click Start. When the deployment is complete, review the Deployment Complete step to determine whether the deployment completed successfully. In the Additional Resources step, review the information that is presented. If manual configuration steps are required, open the Instructions.html file to complete those steps. For more information, see About the Instructions.html and UpdateInstructions.html Files. When you have finished any manual configuration steps, click Finish. If you have not done so already, restart the SAS Analytics Platform by completing the steps in SAS Analytics Platform Server. Note: You might need to restart additional SAS servers. For more information, see “Overview of Server Operation” in the SAS Intelligence Platform: System Administration Guide. If your Web application server is on a different machine from the one that you just configured, stop the managed servers and reconfigure the Web application server on that machine. To validate your installation, open SAS Enterprise Miner and select Help About. Note: The products that are listed in the About Enterprise Miner dialog box depend on the products you have licensed at your site. For more information about upgrading to SAS Enterprise Miner 6.2, see SAS Enterprise Miner 6.2.